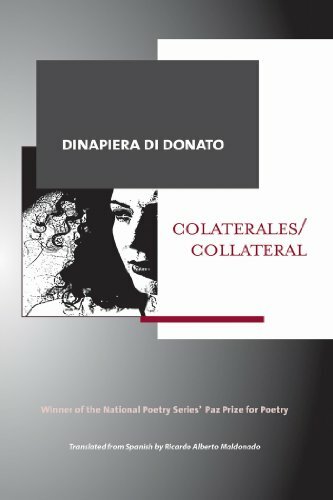 To read Colaterales/Collateral by Venezuelan poet Dinapiera Di Donato is to be thrust without preparation into a world of lush passions played out in the light and shadow of the poet’s surreal erudition. Colaterales/Collateral is the first recipient of the newly established Paz Prize for Poetry sponsored by The National Poetry Series and The Center @ Miami Dade College. Named for the great Mexican poet, Octavio Paz (1914–1998), this prize is awarded to a previously unpublished volume of poetry written in Spanish by a resident of the United States. Di Donato’s lyrical Spanish has been ably translated into English by the accomplished translator Ricardo Alberto Maldonado. Dense with allusions to history, music, and art, this text also reflects the Arabic/Moorish and Hebraic influences and sensibilities that have shaped the Spanish language and its literature over centuries. Di Donato is a poet of searching, of longing and recovery, of a never forgotten past often lodged in raw passion. While normalcy must have its context, in rawness, everything is possible—in performance, in exercise, in revelation. In her poem, “Night Script Written on our Skin,” for example, Di Donato moves effortlessly from Fra Angelico, the great Renaissance painter, to Inanna, the Sumerian goddess of love, the whole poem—the whole book in fact—a tour de force of inventiveness, of uneven lines, broken rhythms, and “indignant/restive” emotion. The poem opens at the Cárdenas River—where recovery begins. At the table of recovery, the messages are decoded, deciphered, and deconstructed into the rawness of desire and its emanations. Through it all, the symbols live, the Nativity ever before her, grist for the poet, a culmination in divine love and adoration. There is a seamless kind of reason in Di Donato’s poems: “the protocol calls for strict ranks of light//the Quattrocento’s artificial paradise sways/a canvas depicting a wreath of DNA and roses/. . .” (“Snow Falls Ceaselessly on the Screen”). Her imaginings into the realm of art merge into the darkness of canvas—indeed a pentimento, a surrogate, allowing contemplations of angels and Madonnas which appear as vulvas, as tongues, as multiple females blinded by light, images that morph into a series of struggles revealing the individual through touch, through the passion of feeling. Di Donato’s recovered vision moves across the landscapes and cultures of the world, across a litany of thinkers, creators, deities, across and beyond the need for sexual differentiations. There is uniqueness in Di Donato’s ability to switch and exchange images, to morph and to recover—moving back into theme and purpose with a smoothness that demonstrates high craft. Following the multiple images and story lines encourages the reader to imagine the collective, the gyre of believing in the modern world. And there is belief here, serially depicted and described, or obliquely referenced—a continuing search for the reality of it all. Colaterales/Collateral is divided into four parts: Inside the Cavern, The Rapture, At Dormition’s Site, and Message Networks (Aurea and the Voices). There is, however, a great deal of overlap among these sections. According to the book notes, “These poems were written during days spent clearing river debris while living along the Hudson River in Manhattan . . .” Wherever these voluptuous poems were recorded, it is evident that they have been developing over considerable time in the cloistered networks of Di Donato’s creative gift. She writes: “but it is night in Manhattan/ between the Euphrates and Tigris/where Eden stood/the myth rises counting its sand . . .” (“The Saint, the Holy Crusade, the Kidnapping”). This is Manhattan across timescapes and seasons, a collapsed world, filled with the heat of desire, of emergency. Love is the perpetual refrain of this volume: failed love, desperate love, violent love, but always intense, lyrical love—and for this love, no price is too great to pay. She watches over the dream of “The Embalmed One,” the dreams of the goddess Inanna and those of Fra Angelico, the dream of Sappho, the urban dreams of modern Manhattan and Paris, and the dreams of antique Sumer. Di Donato dreams her resulting meta-dream in libraries and galleries, along the banks of the Hudson River, and in the arms of lovers. Her dream is the action of myth and belief; her priorities, the priorities of passion. In many ways this collection constitutes a single love poem encompassing everything the poet has experienced—and climaxing in a hope for going on. This volume is revelatory, a testament to Di Donato’s ability to deconstruct the complex weavings and machinations of the human heart.